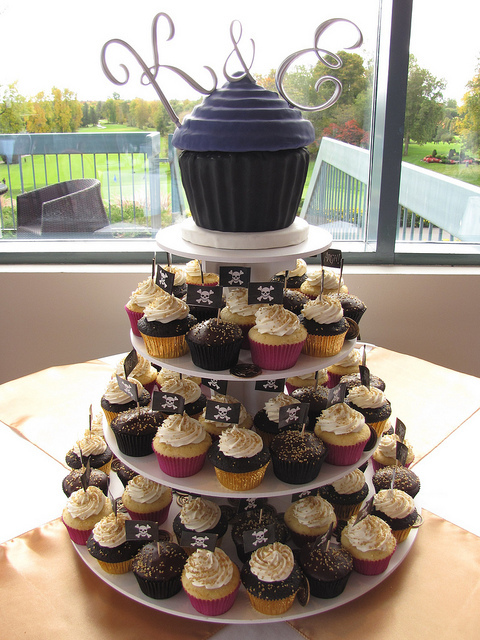 This wedding cupcake ensemble is a combination of lemon cupcakes with lime butter cream, espresso cupcakes with vanilla butter cream and gluten free & dairy free chocolate cupcakes topped with chocolate ganche. (If I am remembering correctly this is our first gluten free cake post..woot woot!) All of the cupcakes are topped with gold sprinkles and skull and cross-bone flags. However, the kicker for me is the gorgeous and giant cupcake that sits a top this masterpiece. It’s a huge red velvet cupcake. Is anyone else screaming “We want the red head! We want the red head! Right now..no? Just me..Anyway, the red velvet cupcake filled with cream cheese icing and chocolate gancahe and covered in purple and black fondant. According to the baker, Clever Cupcakes, flickr album these cupcakes added to the theme of a Pirate Wedding. These are some wedding photos I would love to see! My only question is..why are none of these cupcakes rum flavored? That only seems appropriate. (Side note..in case you think I am crazy..”We want the red head” is from Pirates of the Caribbean, one of my favorite rides at Walt Disney World in Florida.